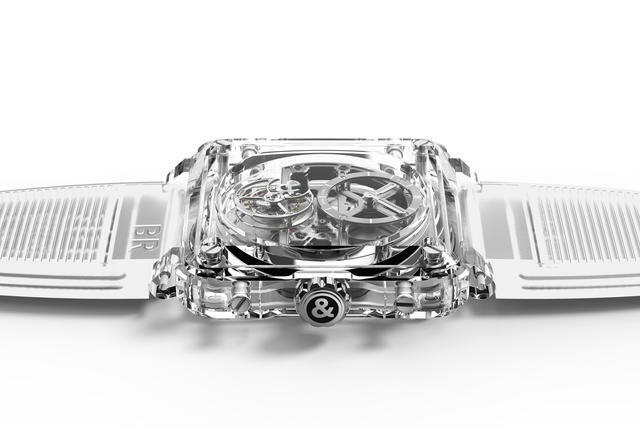 The clear-cased BR-X1 Chronograph Tourbillon Sapphire that Bell & Ross debuted early last year succeeded as both an attention magnet as well as a sales piece. 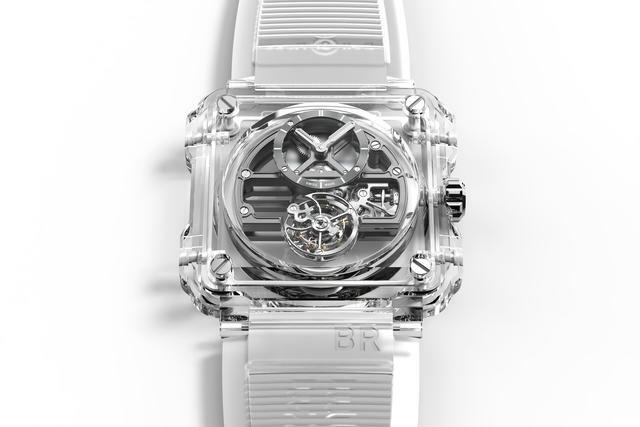 Not only did that watch earn multiple online and print notices, but Bell & Ross sold all five of the pricey pieces (each was priced at about half-a-million dollars), according to the brand. That success may be one reason Bell & Ross this year has created a second sapphire-cased limited edition, the new BR-X1 Skeleton Tourbillon Sapphire. Well positioned within the firm’s Experimental collection, this new model is less complex than that earlier piece, but is far more contemporary in its design. 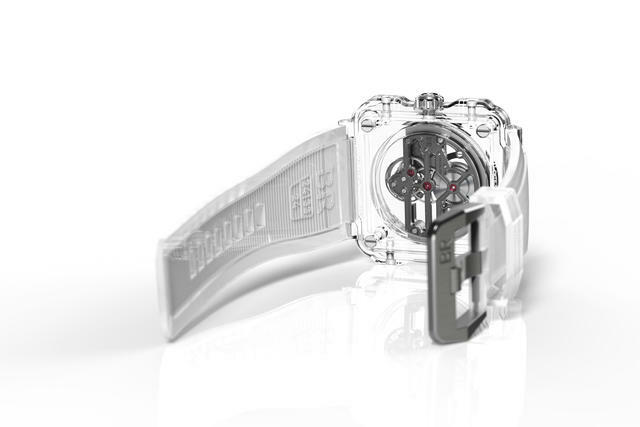 Thus, instead of the monopusher chronograph (and all its familiar subdials) found in that earlier model, here we have a flying tourbillon apparently hanging alone in space, suspended from a horizontal, skeletonized base plate. The open hour counter is set at the top of the dial just above the large barrel, which remains fully visible beneath the hour and minute hands. You won’t confuse this sapphire-cased watch with any of the others we’ve seen in recent years from watchmakers like Hublot, Greubel-Forsey, Richard Mille or Rebellion. Not only is the case shape identifiably from Bell & Ross, the brand has also subtly, yet clearly, labeled itself on this dial. 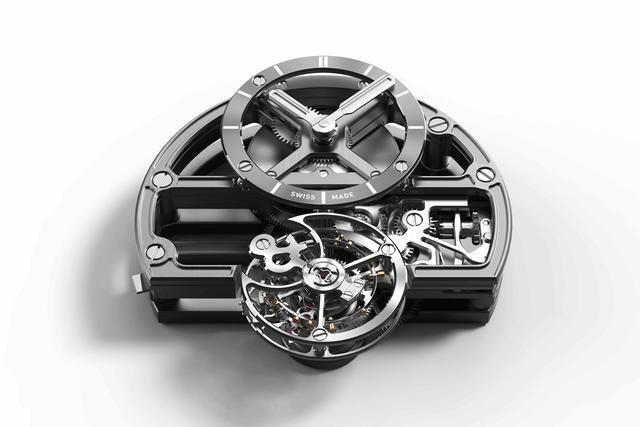 The X (as in BR- X1) and the ampersand (as in Bell & Ross) are perfectly visible, the former as a barrel bridge under the hands, and the latter as a unique seconds indicator on the tourbillon cage. And that cage is not hidden. Instead, it’s set at the same level as the dial. The BR-X1 Sapphire Tourbillon case is painstakingly cut from five blocks of sapphire: middle piece, back, top, crystal and four bumpers, all assembled with the four familiar Bell & Ross corner screws. To match the case’s transparency Bell & Ross has attached a translucent rubber strap, enhancing the ‘floating’ nature of the entire piece as seen on your wrist. 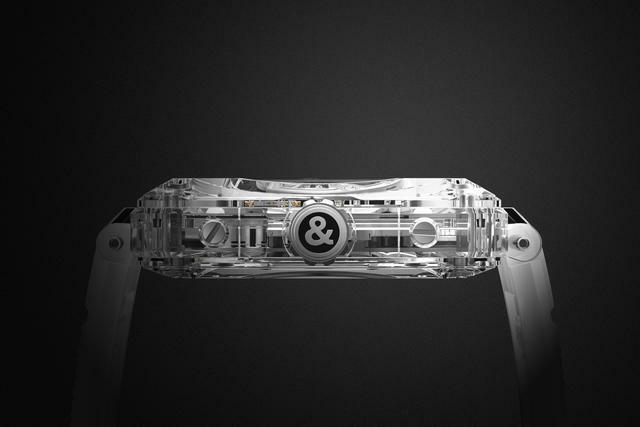 This new watch, launched several weeks ago in a limited edition of eight pieces, is priced at $385,000. Movement: Caliber BR-CAL.288, hand-wound skeleton tourbillon movement with power reserve of 100 hours (more than 4 days), tourbillon cage: off-centered at 6 o’clock position to be highly visible from top, side and bottom. One rotation per minute. 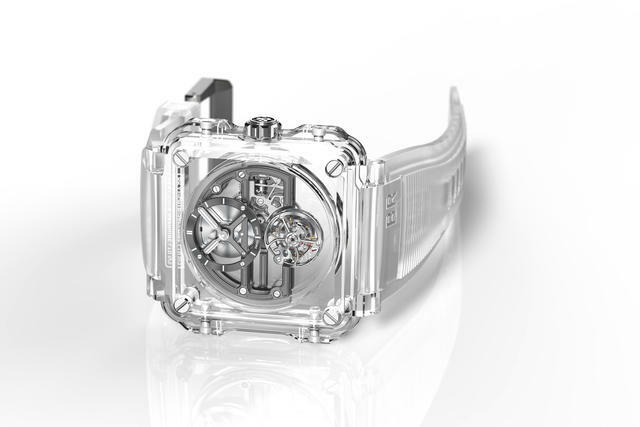 Case: 45mm and cut out of five blocks of pure sapphire and is water-resistant to 30 meters. Dial: Cut from a solid piece of Grade 5 titanium and made of an annular plate with hand-polished bevels and Opaline surfaces. Hour markers are hand painted in white SuperLuminova with a green line. 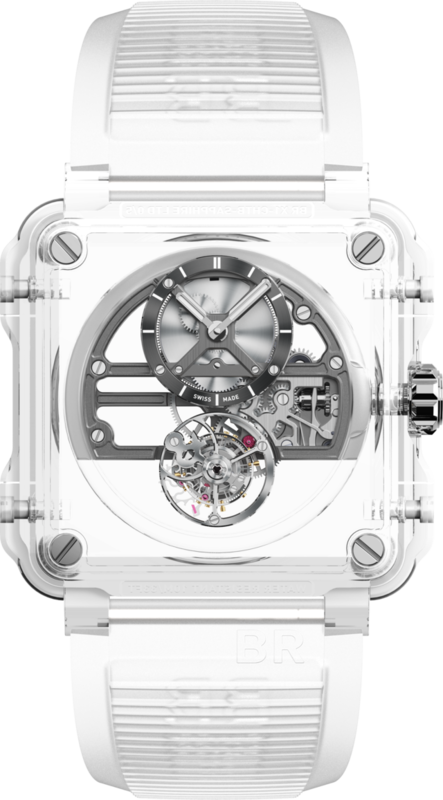 Two-level hour and minute skeleton hands with inside recessed sandblasted zone and outside mirror-polished beveled zones. Openings filled with pure white Superluminova, green line. Strap: Translucent rubber with satin-polished steel buckle.